This fictional freeway has its background in an idea from Steve Riner and Matt Salek. Their idea was for an Interstate, or at least a U.S. highway, running along IA/MN 60 and US 169 from Sioux City to the Twin Cities Metro. The idea has some merit in that the corridor is designated as part of the National Highway System (NHS), with the routes along the corridor either fully 4-lane highway or proposed to be 4-lanes. Most of this 4-lane upgrade, however, is at-grade expressway and not freeway. The whole idea formed the basis behind Fictional I-33. 4-lane freeway with occasional auxiliary lanes between adjacent close-together (< 1mi) interchanges. 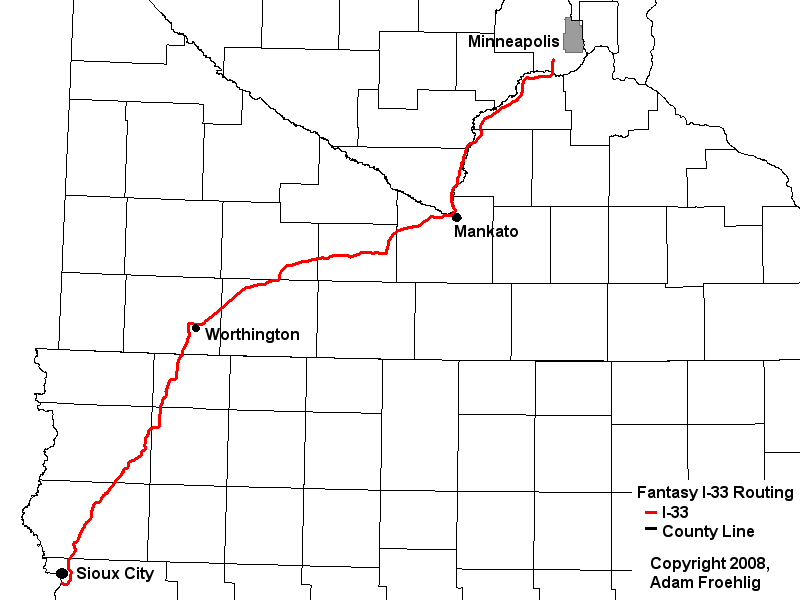 6-lane freeway from Fictional MN 41 to Fictional MN 133. 6-lane freeway from Fictional MN 142 to I-494/MN 5.